Louis Armstrong loved baseball. Couldn’t get enough of it. At one point, the trumpet legend drew up a list of his favorite Brooklyn Dodgers (Jackie Robinson, Pee Wee Reese, Gil Hodges and Duke Snider), but he ended up squeezing for the Yankees in his later life. He attended hardball contests throughout his life, including game five of the 1969 World Series, in which the Miracle Mets clinched the franchise’s first title. It was a sporting love affair that began during Armstrong’s childhood. In his book, Louis Armstrong: An Extravagant Life , Laurence Bergreen recounts that each time the budding trumpet prodigy’s recreational squad, the Black Diamonds, were playing near McDonald Cemetery, they would halt their athletic pursuits and tip their hats in respect when a funeral march passed by. During one such instance, as the Onward Brass Band, led by Joe “King” Oliver, was returning from the funeral, Oliver blared a high note so piercing that the boys’ baseball burst into pieces. Photo courtesy of Hogan Jazz Archive, Tulane University. Louis’ passion for America’s pastime was so intense that, in the early ’30s, he owned his own team, the Secret Nine, in his hometown of New Orleans, even decking the players out in the finest, whitest uniforms ever seen on the sandlots of the Big Easy. of his old stomping grounds. The excursion included a stop in front of 1,500 fans at St. Raymond Park, where Armstrong’s Secret Nine was scheduled to square off against another local semi-pro squad, the Melpomene White Sox, in a twin-bill in late August. An advance article in the Louisiana Weekly circulated the rumor that Armstrong would be in the stands for the game to cheer on his squad. “Folk are declaring that ‘The Cornet Wizard’ will be out there pulling for his clan to come through on the long end of the count and his mysterious order will play like the dickens to lick ‘Cotchie’ Bailey’s club,” the August 22, 1931 issue of the newspaper declared. The fact that Armstrong would be in the stands for the game was in itself a big deal. Satchmo was a lifelong hardball devotee, but according to Grammy-winning writer, jazz historian and former director of the Rutgers Institute of Jazz Studies Dan Morgenstern (who interviewed Armstrong for a 1965 Down Beat story) the trumpeter said he was somewhat adverse to actually attending ball games because fans and autograph seekers would mob him so much that he couldn’t enjoy the game. So the news that Armstrong would attend the Secret Nine-Melpomene game had the city’s African-American community buzzing. But the throngs that turned out for the game — the first half of a doubleheader that featured a Metairie Pelicans-St. Raymond Giants tilt as the feature attraction — were treated to much more. That’s because Satchmo didn’t just make an appearance in the bleachers. He actually climbed the pitcher’s mound to throw out the ceremonial first pitch. It was an endeavor that apparently thrilled the crowd. 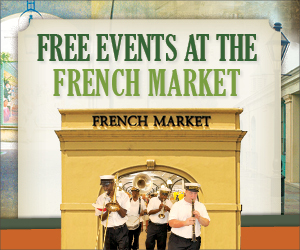 “The 1500 that attended St. Raymond Park Sunday afternoon — a large portion of them attracted there by the announcement that Louis Armstrong…was going to be present — were treated to one of the swankiest, varied bills of entertainment offered here,” the Louisiana Weekly’s August 29, 1931 edition reported. Lindsey then offered up a lame, swinging strike, and Cook, perhaps hamming it up for the audience, threw his mitt up in fright, allowing the ball to smack him in his catcher’s mask just above the nose. That act continued for two more bumbling strikes—or, as the Weekly called them, “stee-rikes.” The playful “ball game” was over with three pitches and a K for Satchmo. The hundreds of fans in the stands apparently ate it up — “the 1500 rolled with laughter,” the Weekly stated at one point — when Armstrong turned his cap around, Lindsey whiffed three times, and Cook bobbled the ball behind the plate. The scene was seemingly so uproarious that the Secret Nine’s clash with Melpomene proved anti-climactic; the Weekly devoted a mere two paragraphs to the contest at the end of a long article dominated by coverage of St. Raymond’s win over Metairie. In the opener, the Melpomene White Sox ended up whitewashing Satchmo’s squad, salting the game away in the seventh inning “when the Nine went to pieces,” the Weekly reported. 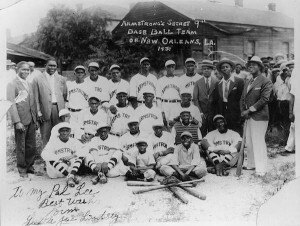 In fact, throughout its brief existence, Armstrong’s Secret Nine was treated as somewhat of a lark by the local black press and community, a fact attributable largely to the team’s general lousiness on the field — performances that contrasted sharply with the splendid new uniforms Armstrong purchased for the hardball conglomeration. Roughly a week before the follies at St. Raymond Park, the Nine was blanked by the New Orleans Black Pelicans, 4-0. 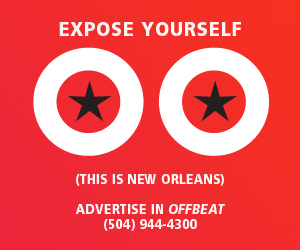 But it wasn’t the actual game that drew the most attention — it was the Secret Nine’s resplendent outfits, a situation that drew thinly-veiled derision from the Louisiana Weekly in its August 22 edition. The repeated characterization of the Secret Nine as a “mysterious order” — and, indeed, the team’s name — are key to the mythology that has sprouted up around the team and its benefactor. Apparently, no one at the time knew much about how the squad came together, and the mystery continues to this day. Multiple biographies of Armstrong and subsequent newspaper and magazine articles assert that the Secret Nine — sometimes referred to as the “Smart Nine” — was comprised of members of the Zulu Social Aid and Pleasure Club. However, current efforts to confirm this assertion proved fruitless; repeated attempts to contact the club’s current historian, Clarence Becknell, failed. What little information that can be gleaned about the squad comes from what little contemporary newspaper reports existed — the only Secret player mentioned in the August 22 Weekly article is pitcher ‘Killdee’ Bowers — and hearsay and rumor that continue to circulate to this day. There is no other mention of the Secret Nine by the Louisiana Weekly — and certainly none in the local, mainstream white dailies — during the 1931 baseball season, and no references exist from the year before, either. The Weekly didn’t offer a post-game report of that clash, and subsequent years of the newspaper don’t offer any reportage of Armstrong’s team, seemingly reflecting the notion that the squad slipped quietly into a hazy myth. “I’m not sure that the team had a long life, and if it really was ‘semi-pro’,” Morgenstern writes in an e-mail. Still, both currently and at the time, jazz aficionados and journalists were and remain aware that Armstrong was connected with a New Orleans baseball team and that the trumpet great loved the American pastime. The persistent shortage of detailed information about the Secret Nine is, perhaps, to the benefit of the Armstrong story, which itself is filled with similar intersections of legend and reality, myth and truth.